available four days a week. in the highest quality oral health care available. and tailored to your needs. Each dental procedure is designed to restore your oral health and improve your tooth function and appearance. Our environment allows your cosmetic and restorative dentist in St. Simons to provide you and your family with a comfortable treatment experience. The health and appearance of your teeth are improved with cosmetic dentistry. 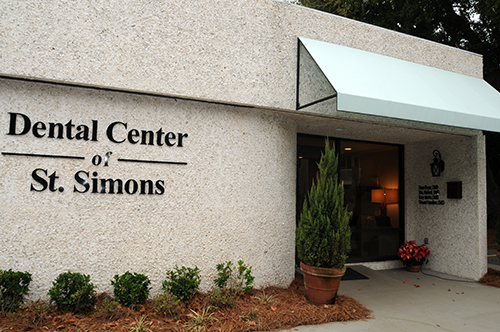 The procedures available to you in our St. Simons dental office include professional teeth whitening, porcelain veneers, inlays and onlays, and other oral health solutions. Tooth damage is treated and solved with restorative dentistry. Solutions for renewing your tooth appearance and function in St. Simons include dental implants, implant dentures, bridge implants, and the efficient Teeth in a Day procedure. Invisalign orthodontic treatment is also available from your St. Simons restorative dentist. Invisalign in St. Simons straightens and aligns your crooked and misaligned teeth to improve your health and appearance. Contact your dentist in St. Simons about cosmetic dentistry and restorative dentistry treatment. Schedule you and your family’s next oral examination. Visa, MasterCard, American Express, Care Credit, Discover. We file most insurances. Please call for insurance verification. Our equipment is state of the art and maintained at the highest standards. Patient comfort is always our #1 priority. With over 50 years of combined experience, our dentists are experts in all facets of the dental industry.